This the third part of a series on finding the area of a trapezoid here in PH Civil Service Review. In the first post, we discussed the derivation of the area of a trapezoid and give a worked example. In the second post, we discussed how to find the area given the base and the height as well as to find the height given the area and the base. In this post, we are going to find the base, given the height and the area. We continue with the fourth example. A trapezoid has area 65 square centimeters, height 13 cm, and base of 4 cm. Find the other base. In this post, which is the second part of Finding the Area of a Trapezoid Series, we are going to continue with some examples. We will not only find the area of a trapezoid, but other missing dimensions such as base and height. Now, get your paper and pencils and try to solve the problems on your own before reading the solution. We have learned how to calculate the areas of a square, rectangle, parallelogram, and circle. In this post, we are going to learn how to find the area of a trapezoid. This is the first post of Finding the Area of a Trapezoid Series. A trapezoid is a polygon whose exactly one pair of sides are parallel*. 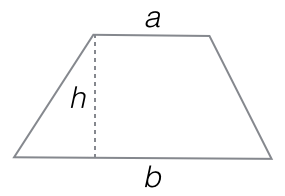 The figure below is a trapezoid where sides a and b are parallel.